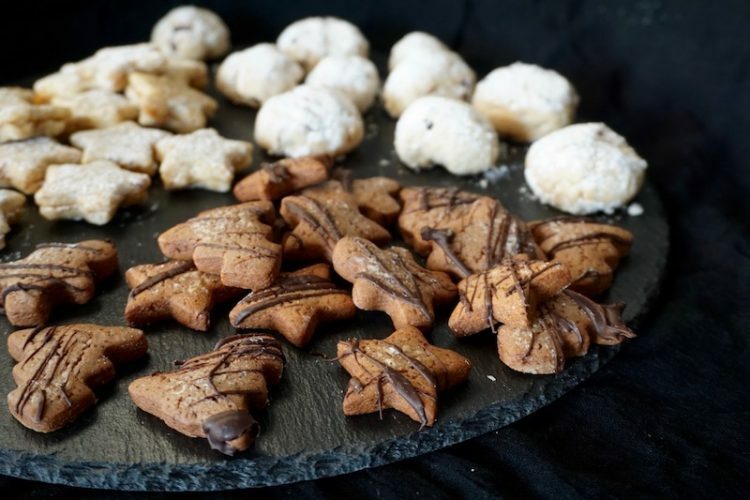 And this post brings us to my last Christmas cookies recipe: chocolate gingerbreads. With these I always go a little wild with my cookie cutters. And I am excited to have chocolate & gingerbread flavors also besides orange and stollen in my Christmas cookies mix. I always let the chocolate drizzle very wildly over the cookies, because I like the way it looks in the end and it just is so much quicker than any other method (not to underestimate, the time saved in a tightly packed christmas season). I hope you are now well equipped with amazing Christmas cookies recipes. Please do tell me in the comments, what your favorite Christmas cookies are and when you’ve tried mine, how you like them. And do not stress too much anymore before Christmas comes up in just 10 days. If you only bake your favorite cookie that is totally fine as well. Do not set yourself under too much pressure in todays crazy consum-oriented times. Instead just turn on Christmas songs, sing loud along with them, look forward to spending the holidays with friends and family and in a bright mood cut out your Christmas cookies! Add 300 g of honey, 150 g brown sugar and 100 g butter into a pot and warm at medium heat. As soon as the butter has melted while stirring from time to time and the brown sugar has dissolved completely, remove the pot from the stove. Let col for 10 minutes. Meanwhile stir together 500 g flour, 1 pack of baking powder, 3 heaped tsp cocoa, 4 tsp gingerbread spices (see note above) and 1 pinch of salt. Add the lukewarm honey-butter-mix together with the 2 egg yolks to the flour in the bowl. Knead together well with the knead hooding of a kitchen machine. When the dough has reached a smooth consistency separate it into 2 portions. Cool these wrapped in foil in the fridge for at least 2 hours. Preheat the oven to 340° F (170° C, upper- and lower heat). Prepare baking trays with baking foil. Roll out the first dough potion on a floured work surface to approximately 4 mm thickness. Cut out cookies (mine are not larger than my thumb) and place these on the tray. Gather the rest of the dough, knead together and place in the fridge again working the next round with the second portion. Brush the cookies with heavy cream (I find this works best with ones (washed!) finder). Bake for 10 minutes in the hot oven at 340° F (170° C, upper, and lower heat). Meanwhile cut out the cookies for your next batch. Let the baked cookies cool on a roast. As soon as all cookies have cooled down, cover a surface with aluminium foil and place all of them close together on it. Melt 100 g of chocolate and drizzle with a fork over the gingerbreads. Keep well till after Christmas in a tightly closed, stored cool tin can.